I think that the period starting 6 years ago with the first 3D accelerators is not that big so that the teenagers do not know anything from the 3D history. However, I met some students specializing in computer engineering who had no idea about Riva128, RAGE II, Voodoo Rush etc. 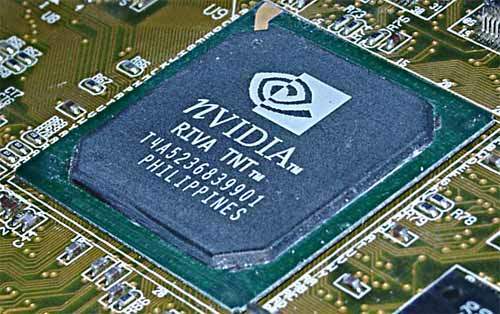 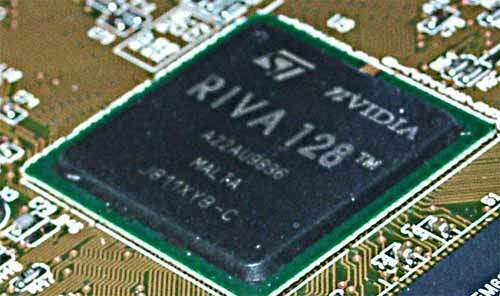 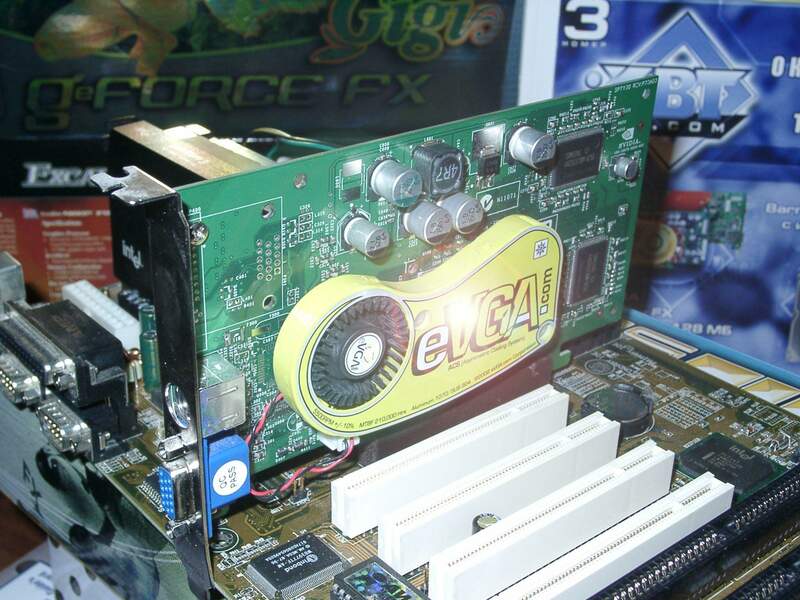 The very Riva128 card that saved NVIDIA from death after its failure with the NV1. 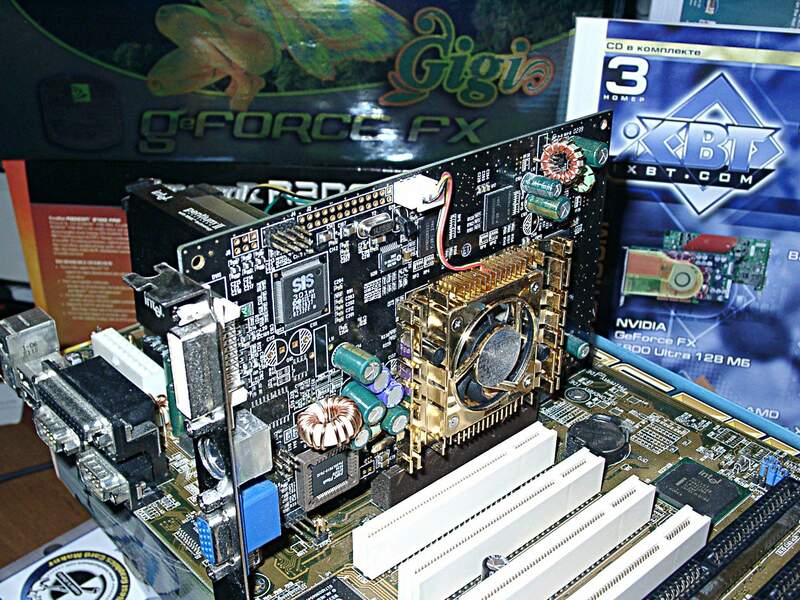 Intel's first attempt to try itself in 3D graphics after the purchase of Chip & Technologies. 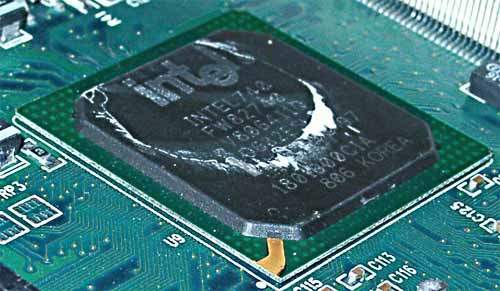 I remember our editor saying in the beginning of 1998 that Intel would soon stomp the Riva into the ground with its new much more powerful product... However, the reality was not so bright. 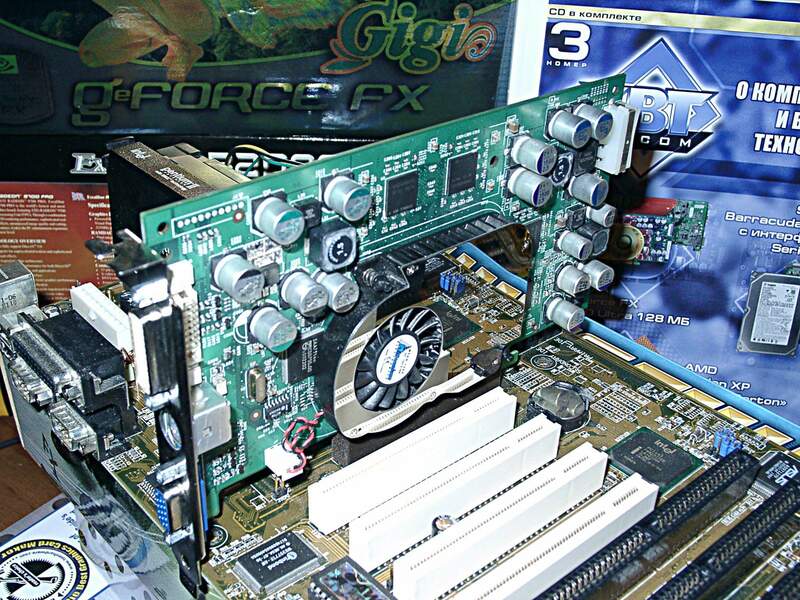 Here is the Voodoo2 itself.. lying on the shelf. 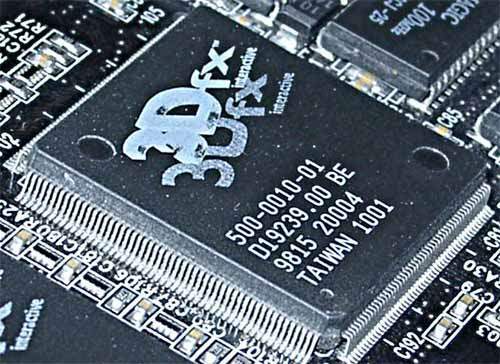 So, where is Creative located? 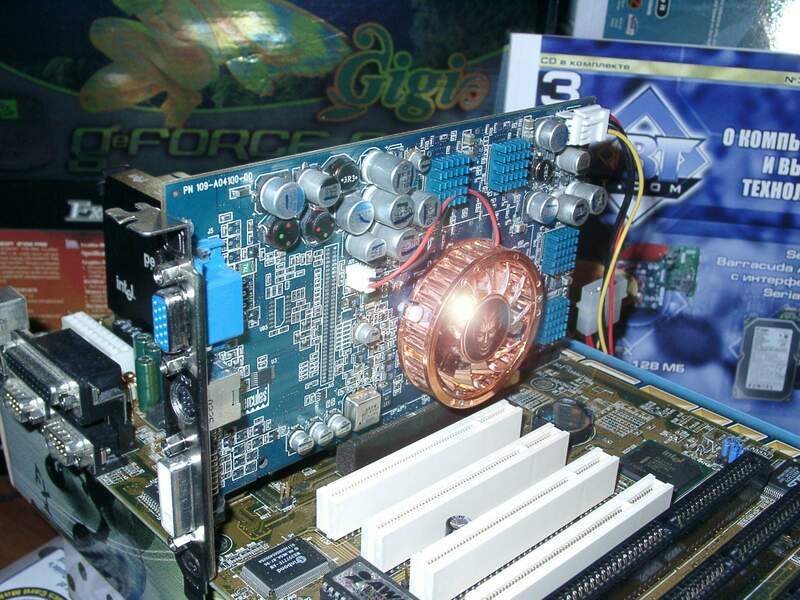 I give you one minute to think, otherwise you won't get the souvenir! 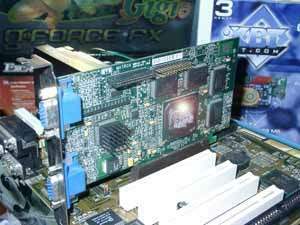 These cards were very pricey at that time, over $350 for the 4MB card. The 2D king in speed and quality - Matrox MGA. 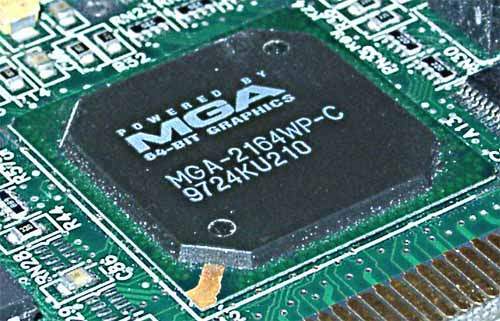 Although this is the Millennium II chip depicted, the first MGA1 look exactly the same. 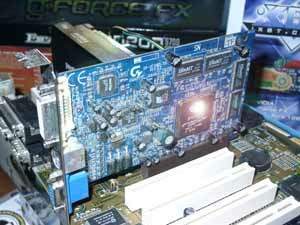 In spite of all ATI's efforts to keep prices, Matrox damaged their plans completely... $500 for the Millennium1 in the beginning of the sales. How carefully users were keeping the boxes with such cards in their hands! 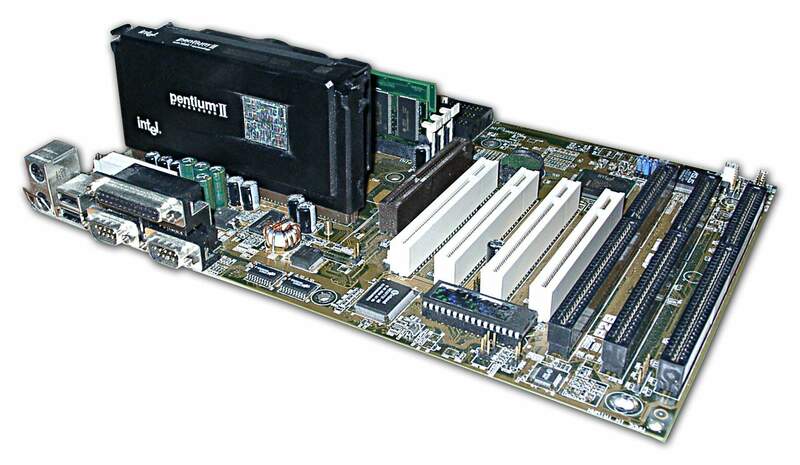 The 3D leader for the autumn of 1998. This was a kind of trinitrotoluene for 3D enthusiasts. 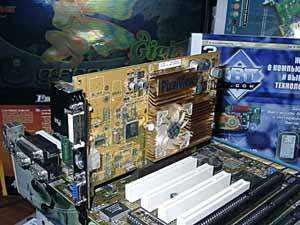 Although it was a very difficult situation in Russia at that time, RivaTNT managed to gain the popularity there. 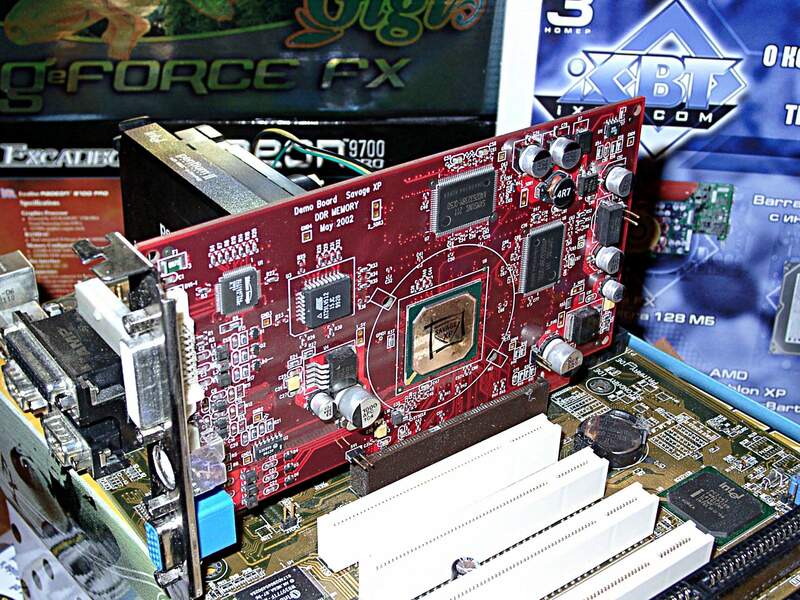 Nostalgia... 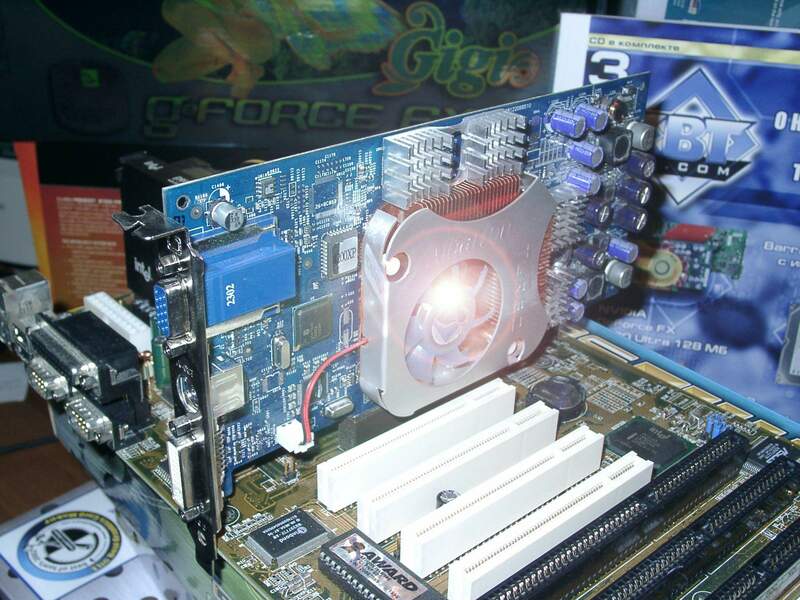 This is only a part of what I can speak of for hours. But let's get back on the track. 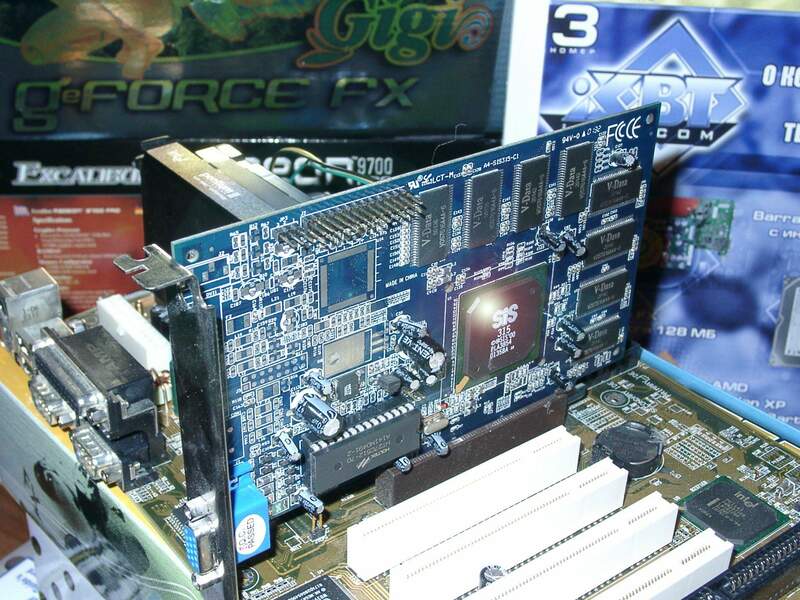 Not so long ago we tested a great number of 3D accelerators from the latest models to those released in 1998. 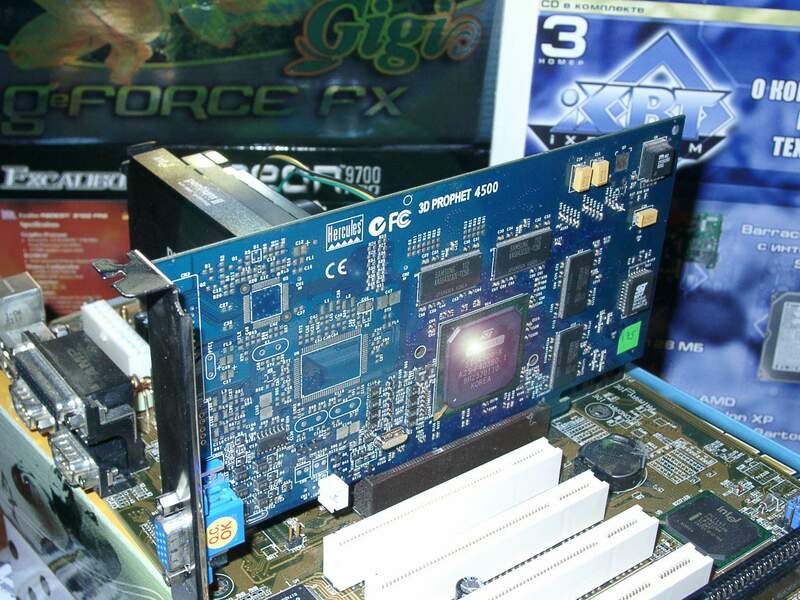 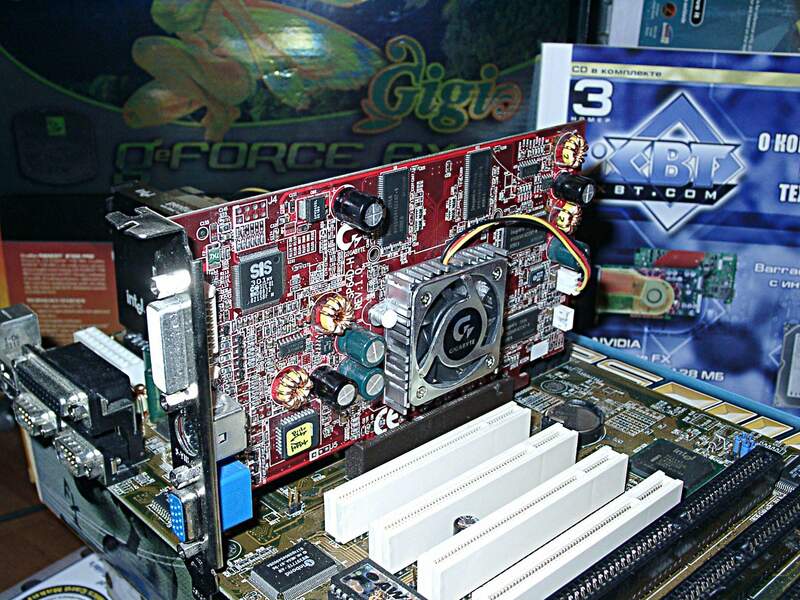 We were to find out whether old video cards were compatible with the modern AGP 3.0 mainboards, as well as to compare the speeds in three tests (with the highest 3D quality). 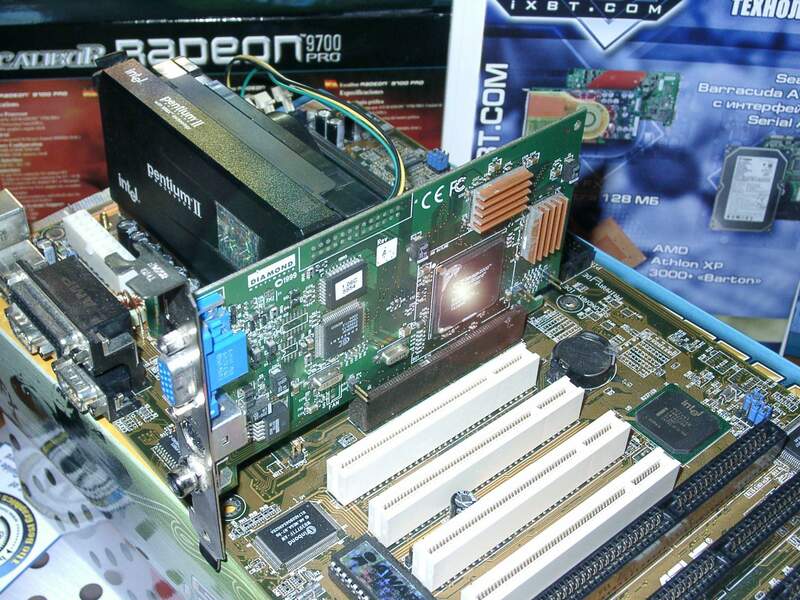 To demonstrate performance of old accelerators in modern tests, first of all those which can't work on modern AGP 3.0 platforms. So, let's start with the participants. 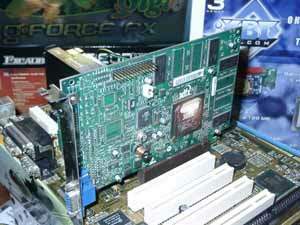 They will be introduced in the chronological order like the last time. There is nothing to comment on much, especially because the "stars" are marked with the "shine" coming from a given processor. 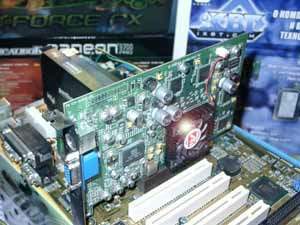 It was an idol of the end of 1997. 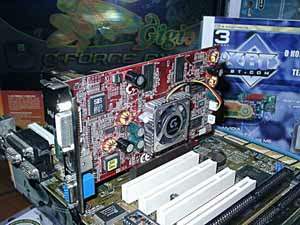 Sky3D's card. The dual accelerator goes on the Quantum3D's card - Obsidian2 X-24. 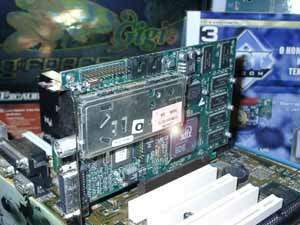 LuckyStar's card. It wasn't much popular because of the buggy 2D. 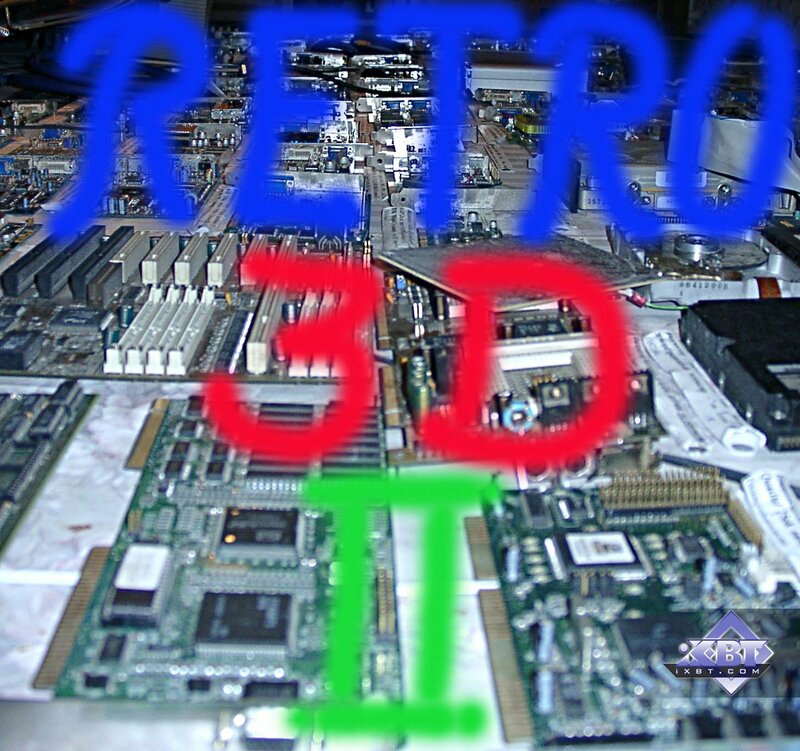 Its 3D quality wasn't shining either. 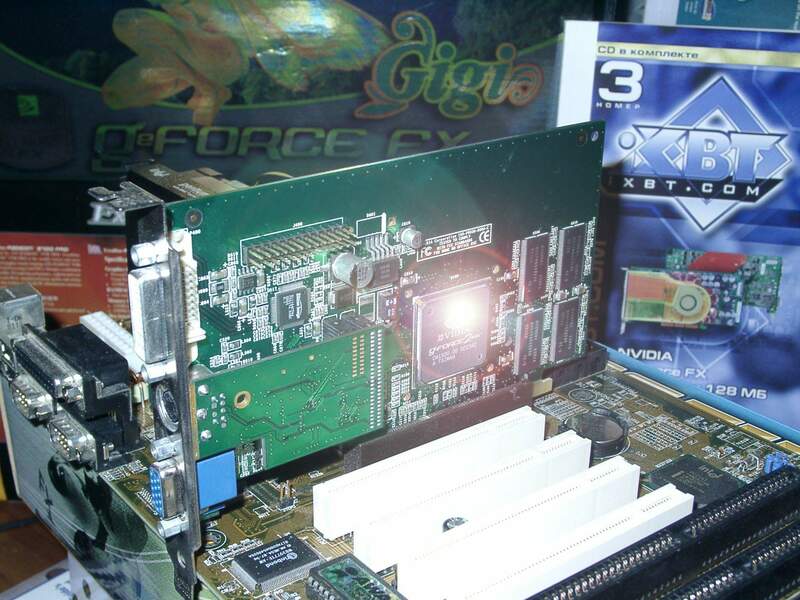 Hercules's card. 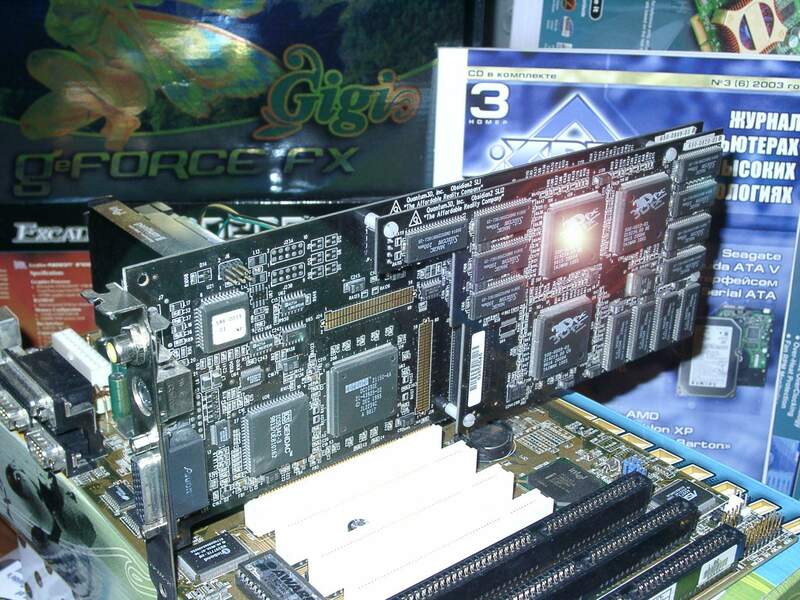 The last of the Mohicans ... of old Hercules. At that time the Canadian company made the cards itself. 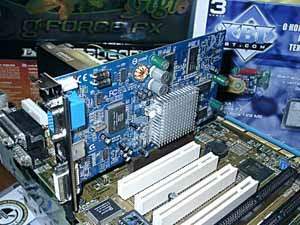 The launch of this chip was marked with the purchase of Diamond Multimedia by S3, that is why it's easy to guess that this card was from DM. 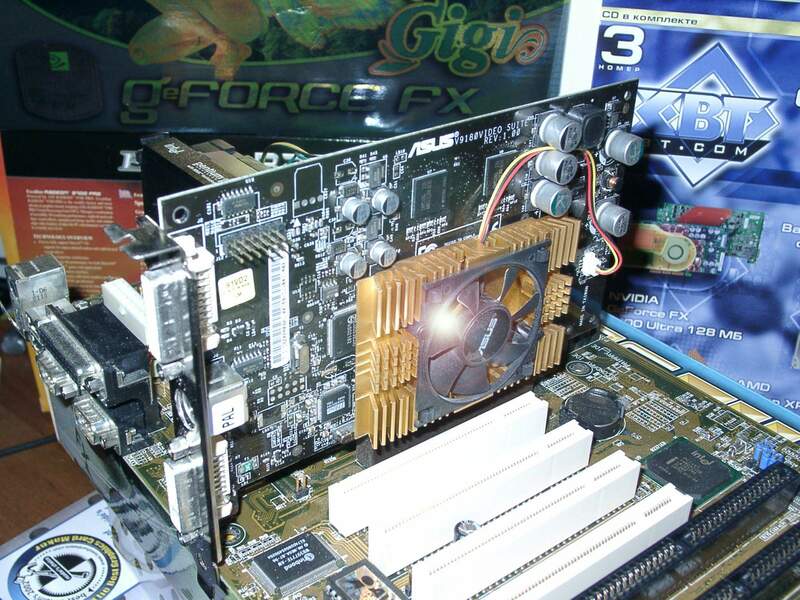 NVIDIA's reference card built on the GeForce2 MX; in the tests it was overclocked up to the clock speeds of the MX400 - 200/183 MHz. 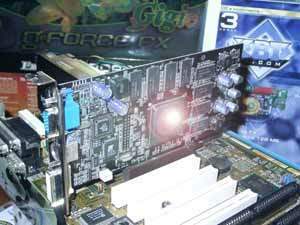 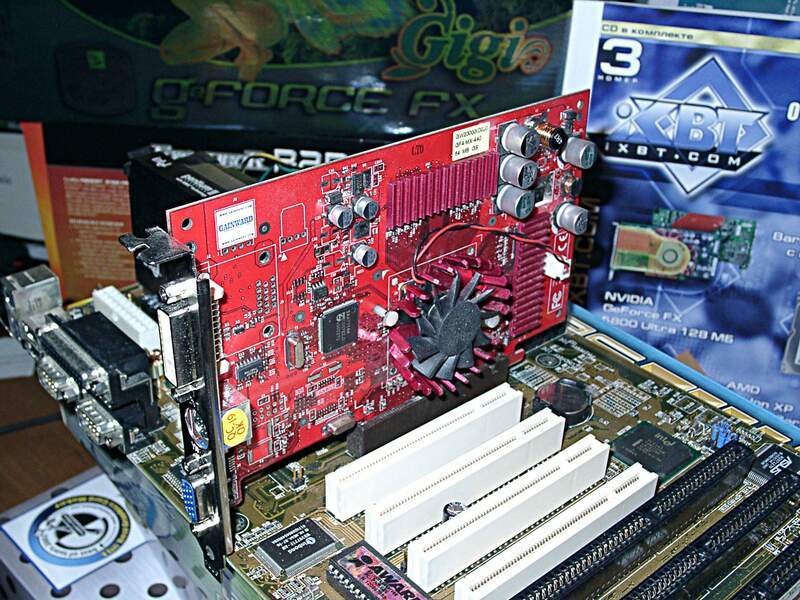 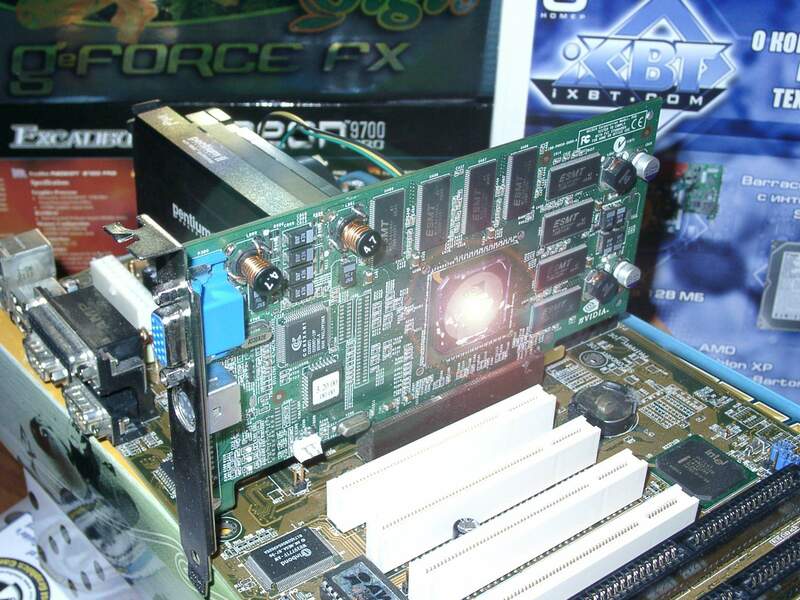 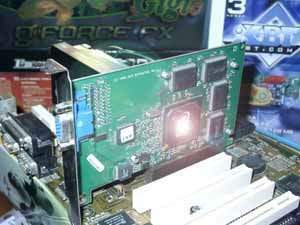 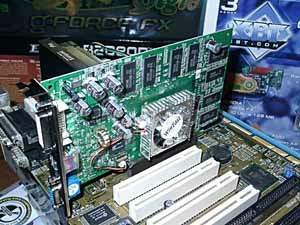 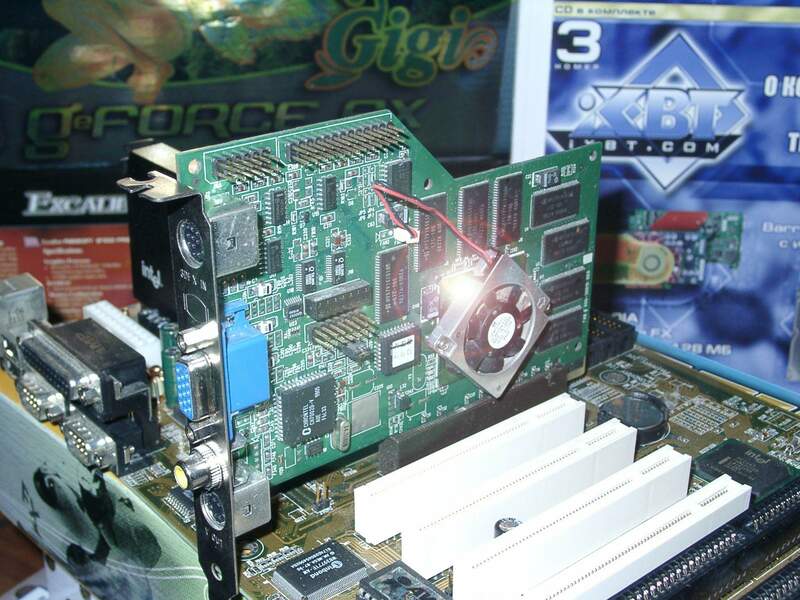 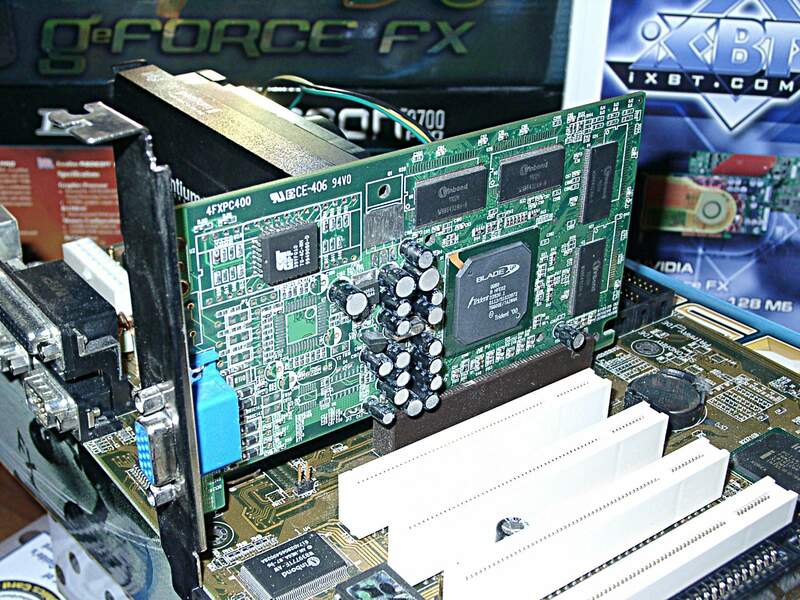 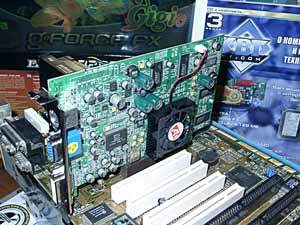 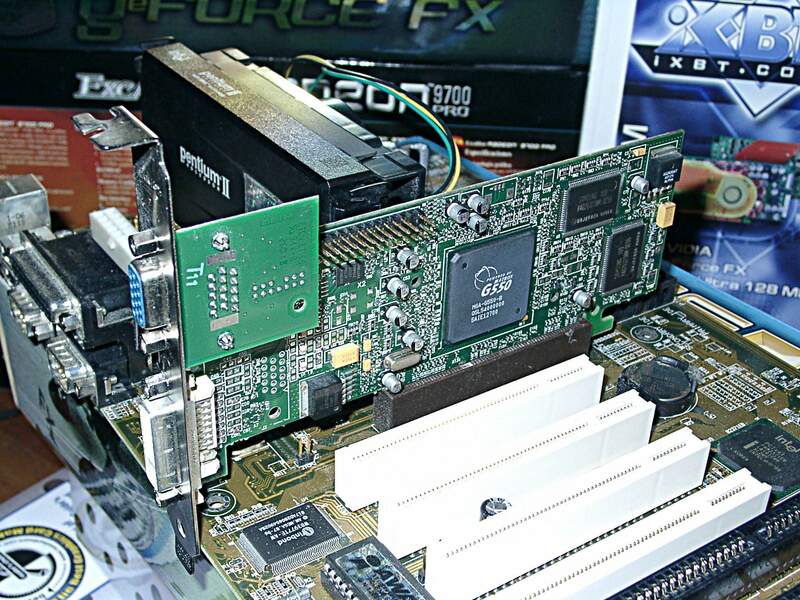 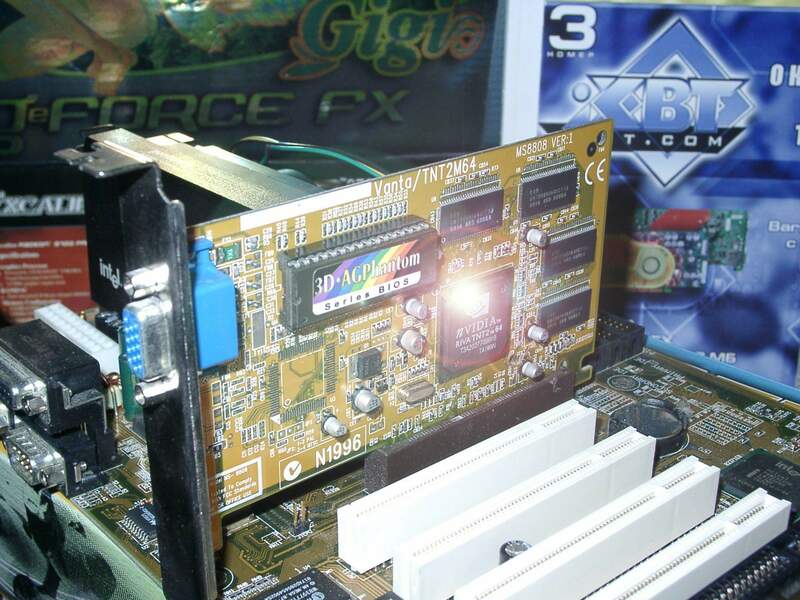 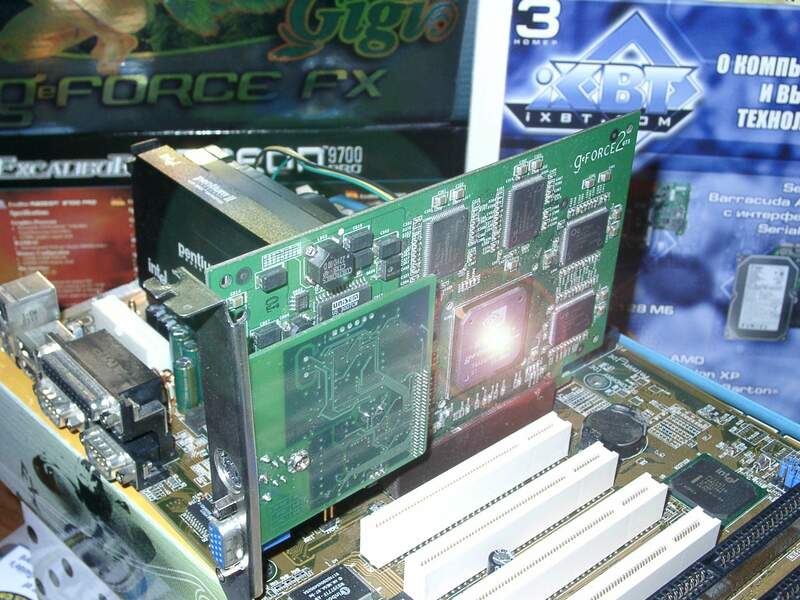 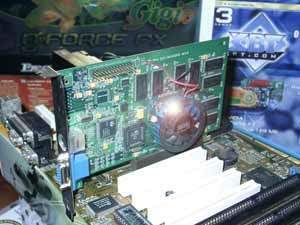 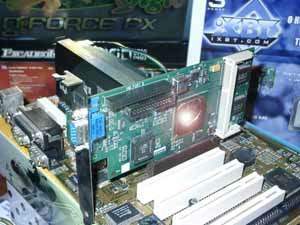 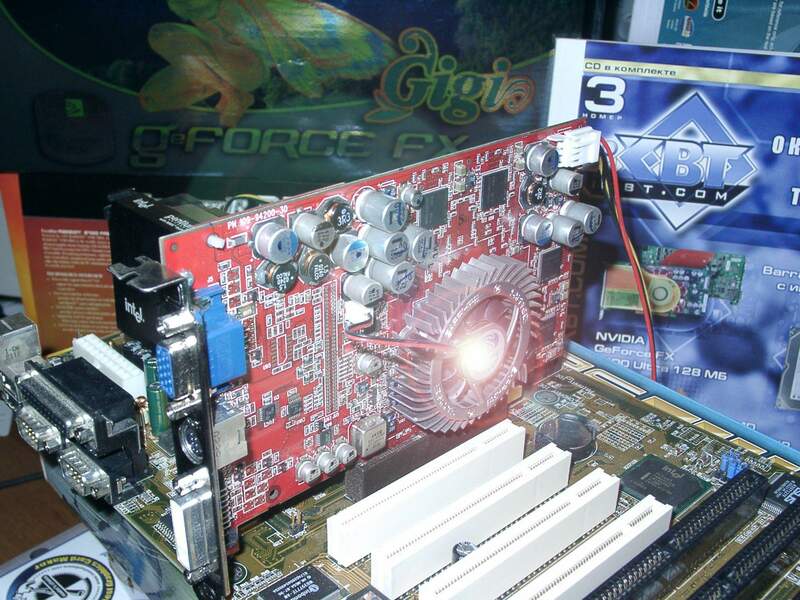 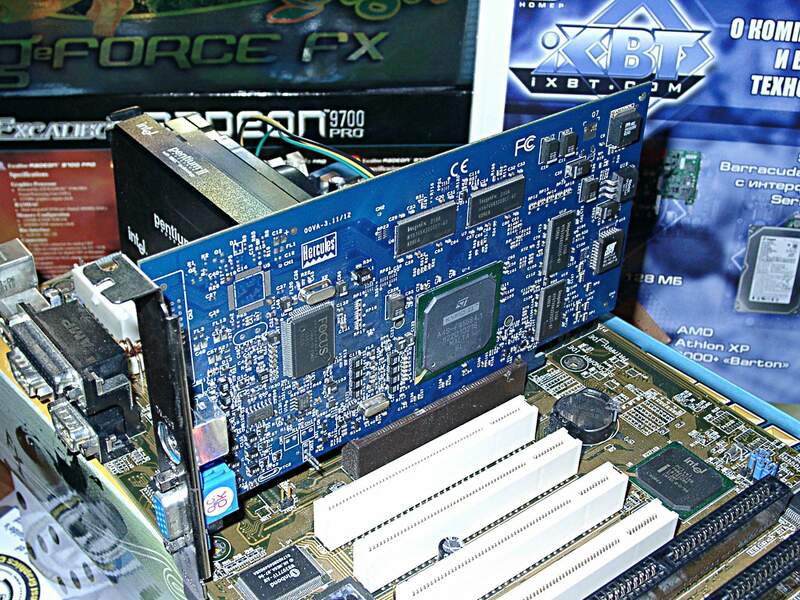 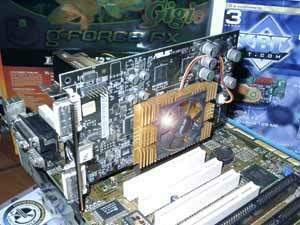 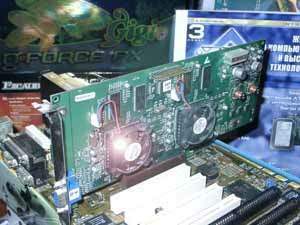 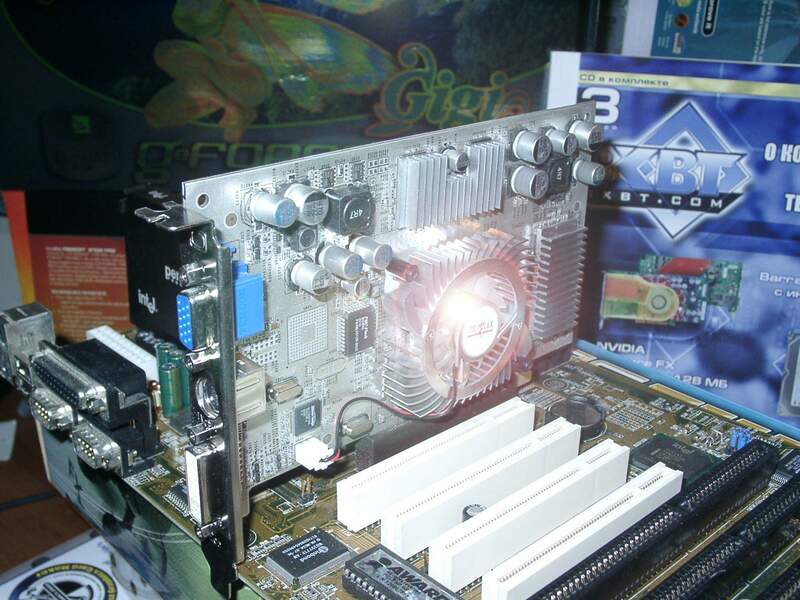 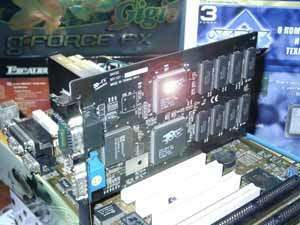 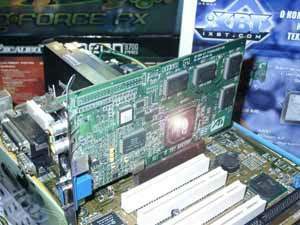 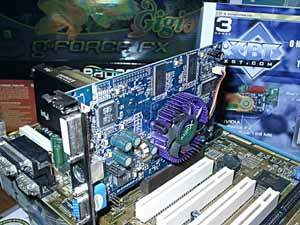 3dfx's card made at the STB's factory (3dfx bought this firm yet in the end of 1998). This new old product tops the Matrox's card. 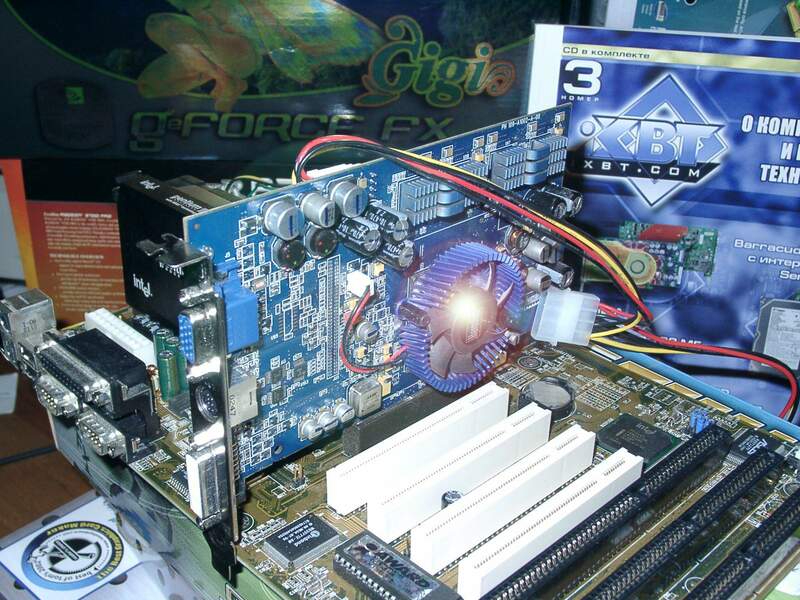 This is actually a 2D card, its 3D mode was very weak for 2001, and the card failed to become a 3D star. HIS's card. Its low speed and buggy drivers didn't let this card gain any popularity. This is a demo card, i.e. a video card on the early silicon, that is why the T&L, for example, does not work there. 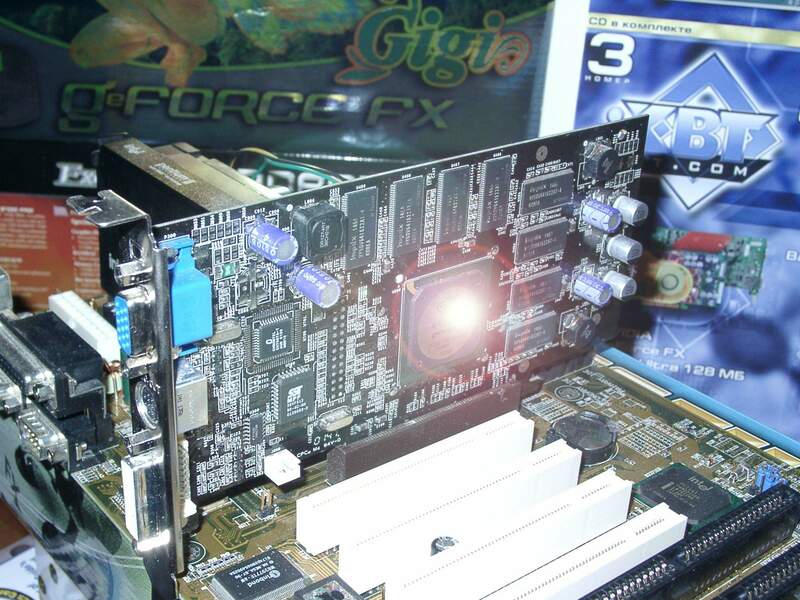 Production of such cards wasn't even started. Hercules's card. 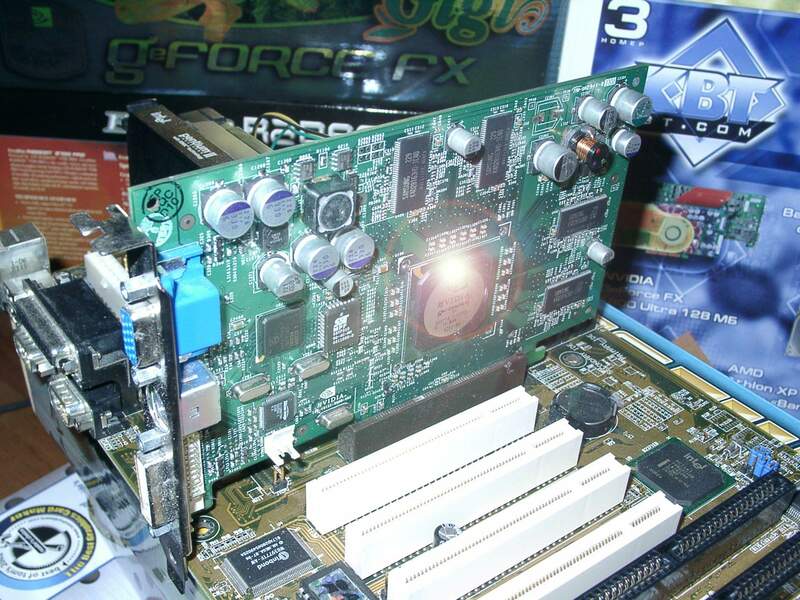 This card is actually dead too. 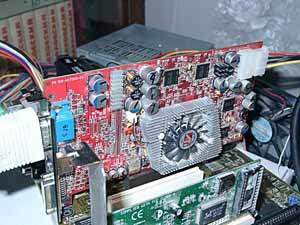 ASUSTeK's card, the clock speeds are set by default - 275/513 MHz. 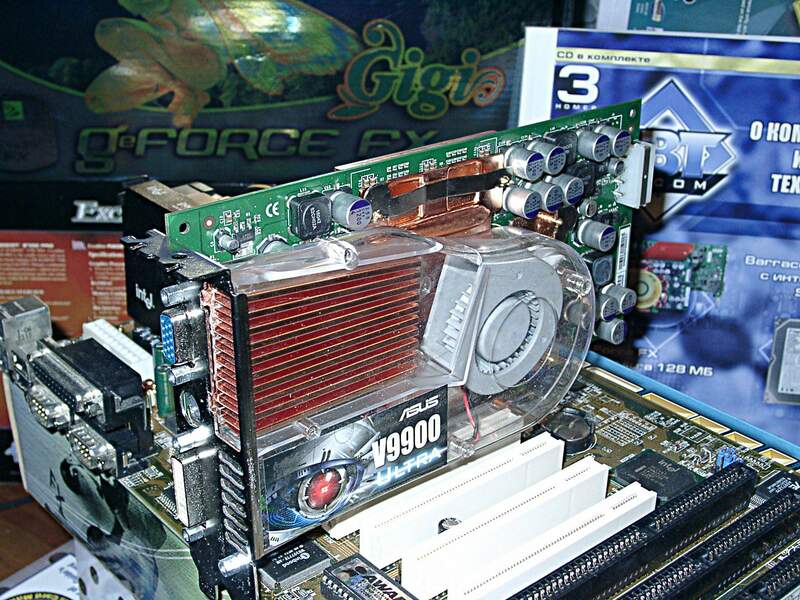 Gainward's card; it works at the higher frequencies of 300/600 MHz, but the price, being too high, stood on the way of its popularity. 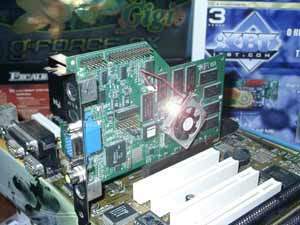 Prolink's card. 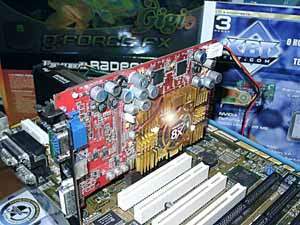 128 MB on such cards is not needed. 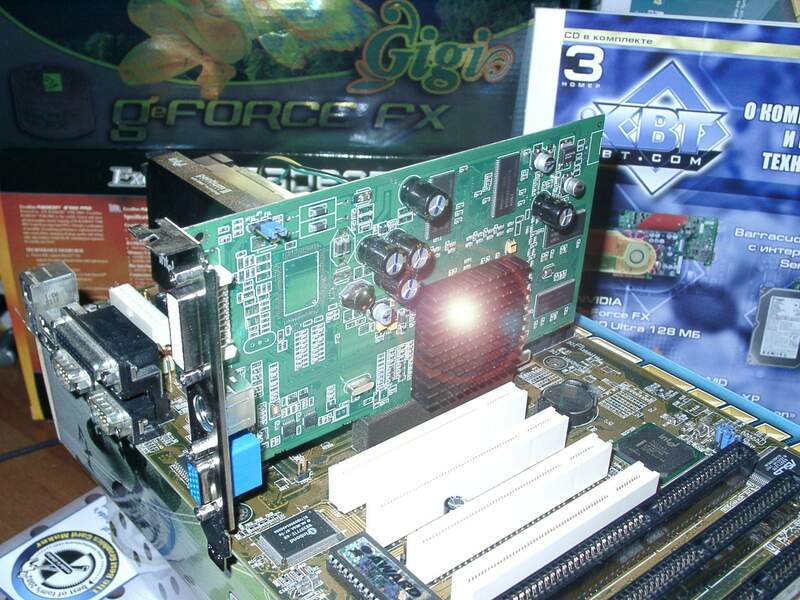 ABIT's card. Probably, such cooler gave NVIDIA the idea of FlowFX with its terrible noise. This is actually the very RADEON 8500LE, just renamed into 9100, that is why its processor is "shining" here, - the RADEON 8500LE was very popular. 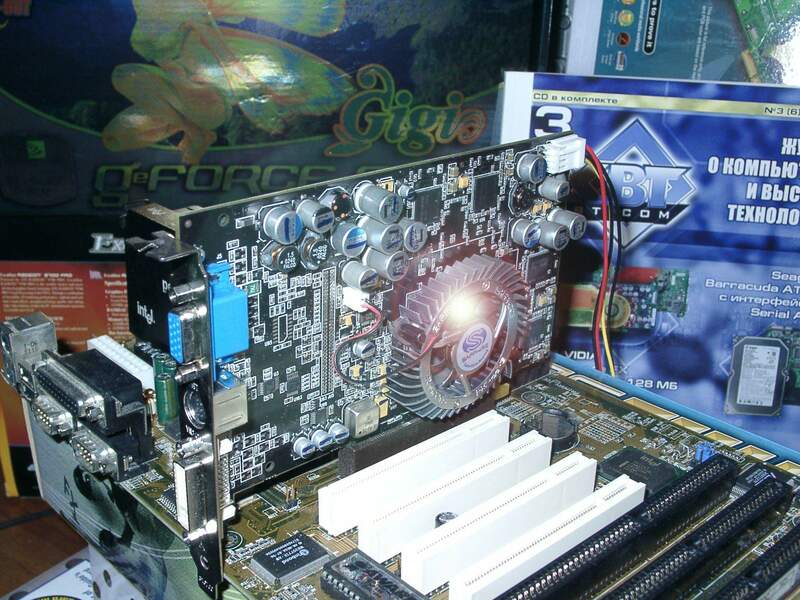 ATI's card. This is a new old product: the chip is the same 8500LE, but the memory used is different. 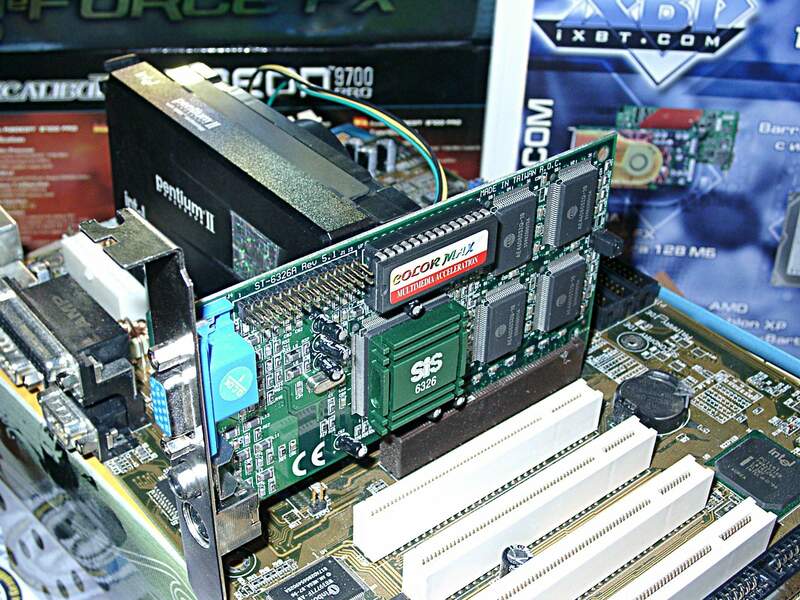 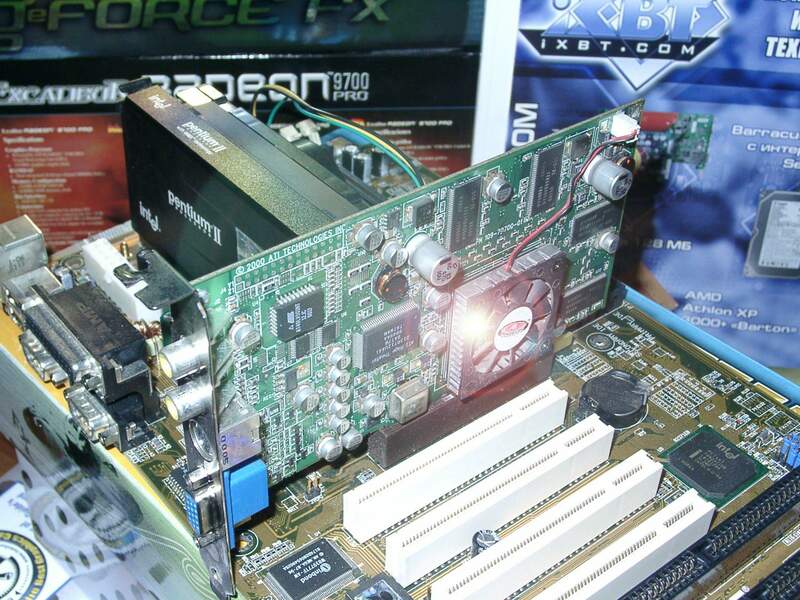 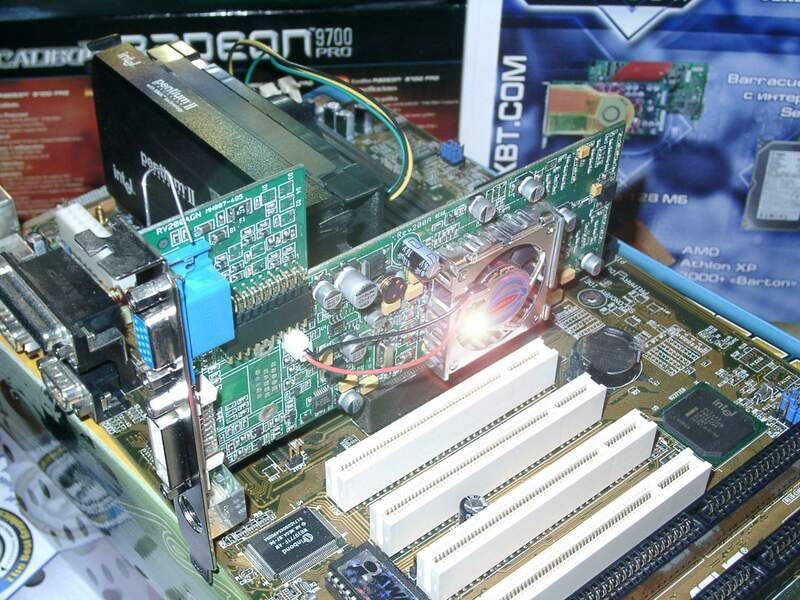 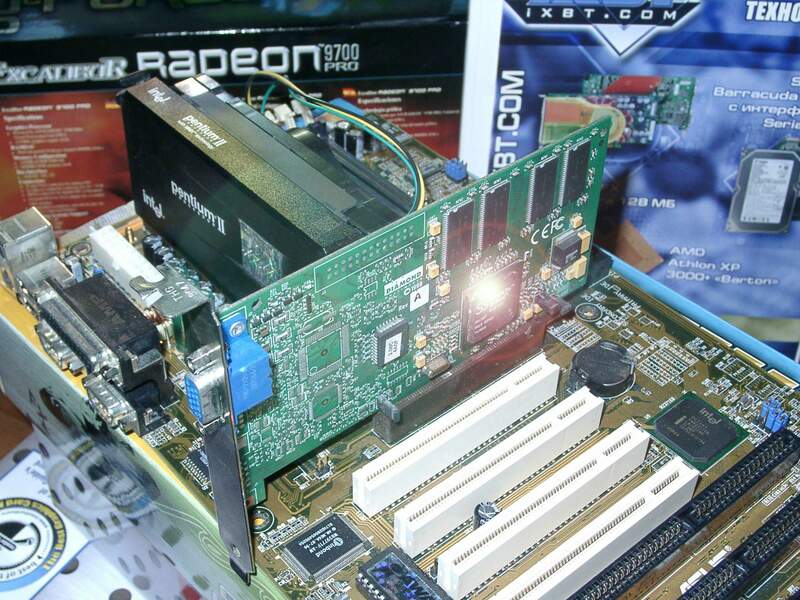 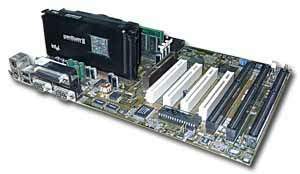 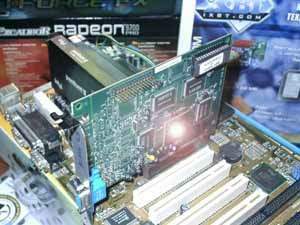 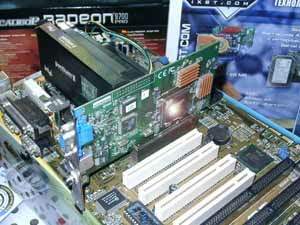 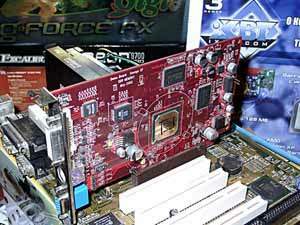 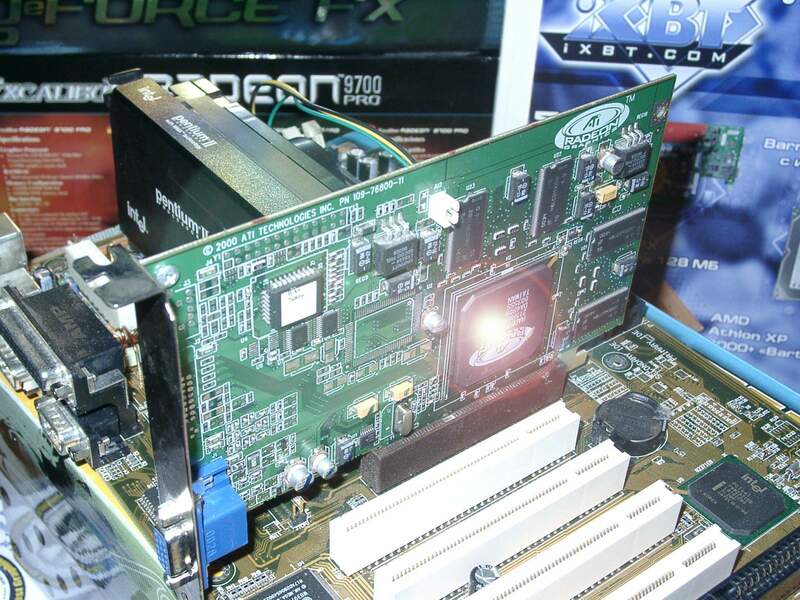 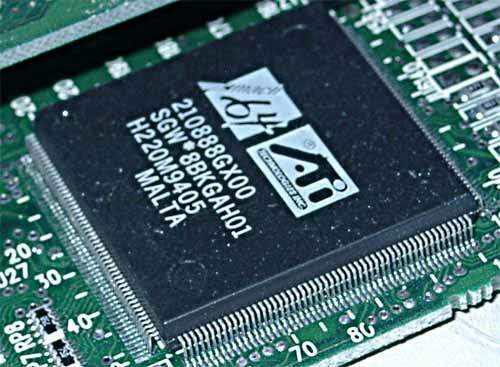 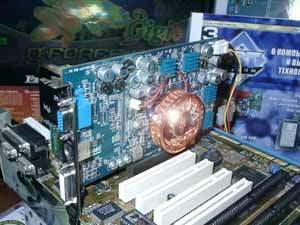 The former RADEON 8500LE with 128MB memory was completed with the BGA memory. 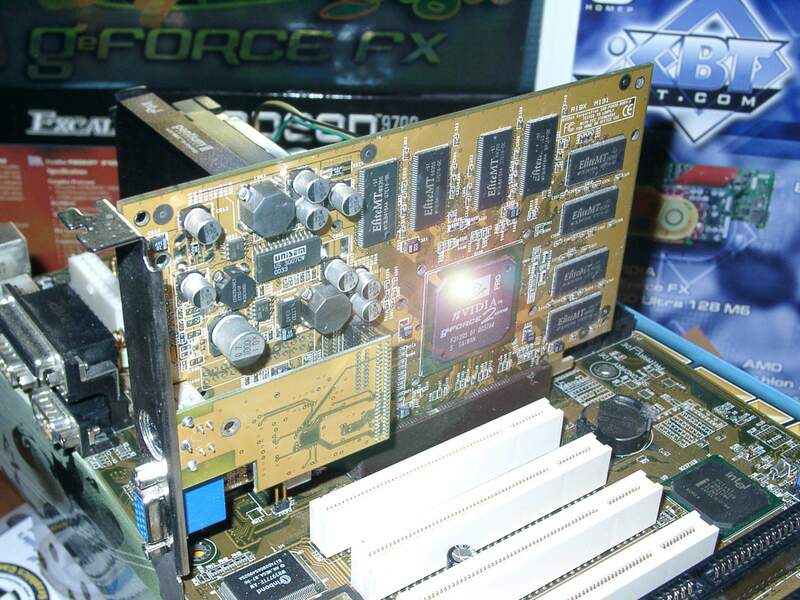 Now we have old chips in the TSOP package. PowerColor's card. 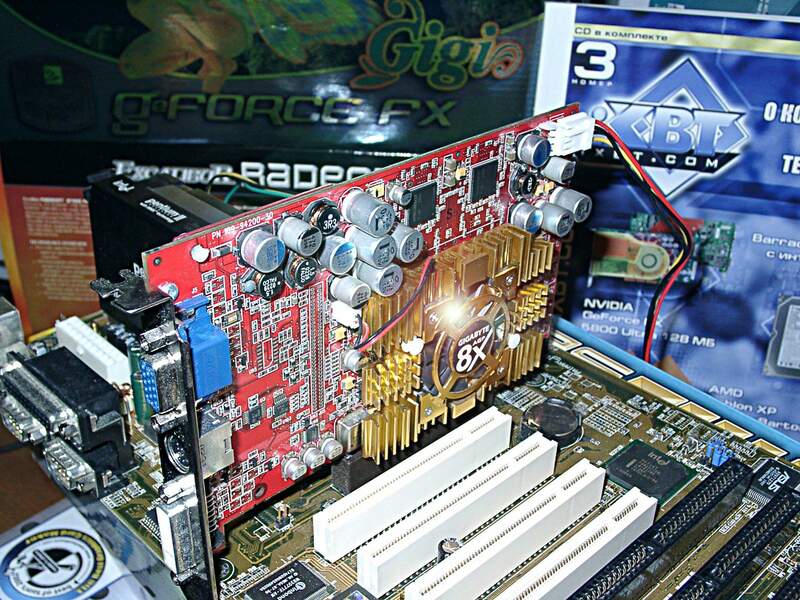 The most popular Sapphire's product; it has a 256bit card and, therefore, can be redesigned into the RADEON 9700. 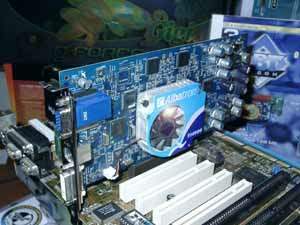 Joytech's card (128MB is not needed at all here). 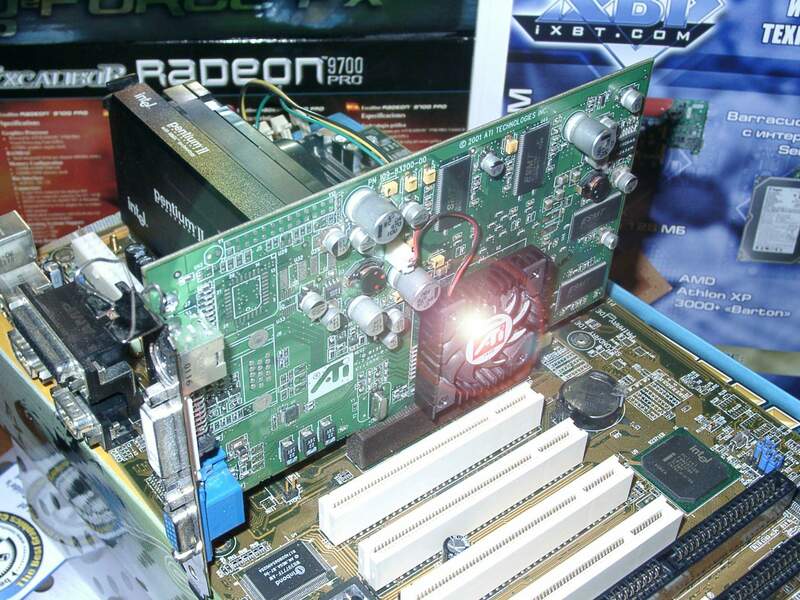 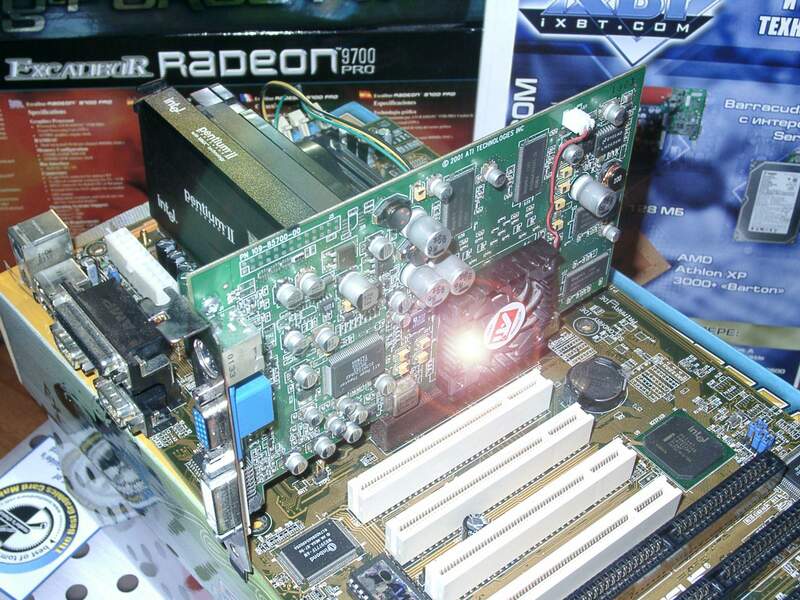 The same RADEON 9000 just with the AGP 8x support. 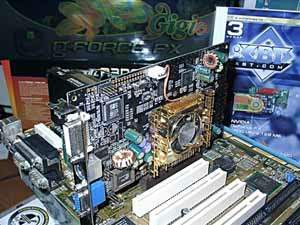 Gigabyte's card. 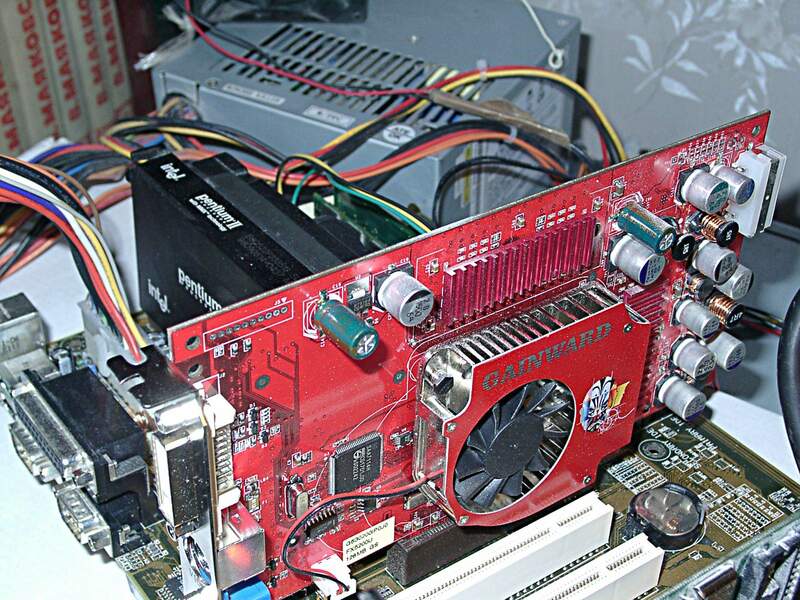 The fastest card for today. 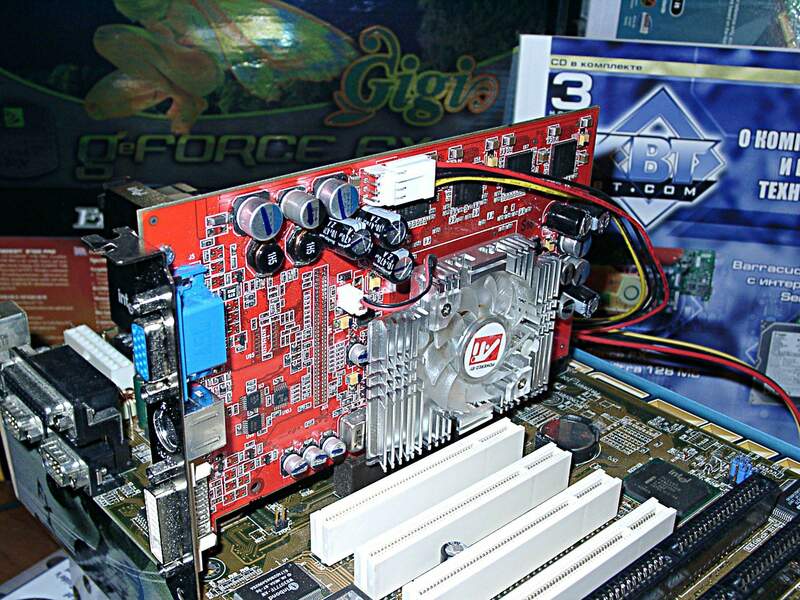 ATI's Reference card. 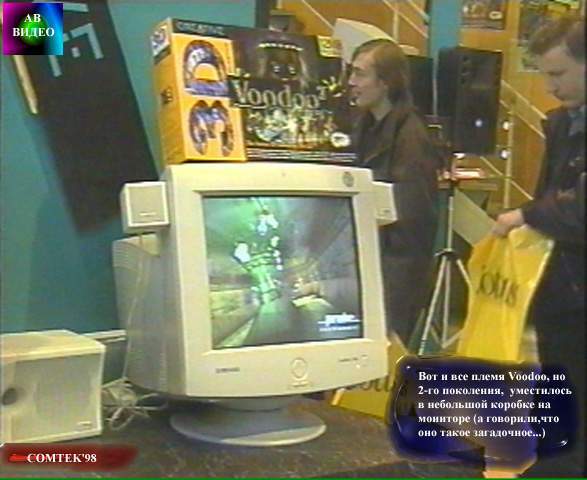 All latest drivers for the moment (end of April, 2003). VSync off in the drivers, texture compression off (in games), texture detail set to High Quality. 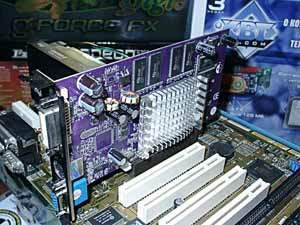 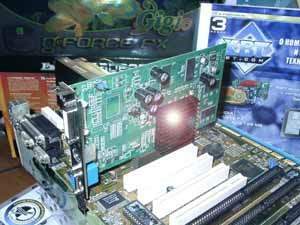 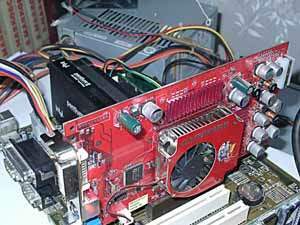 The Voodoo2 SLI, Voodoo3, Voodoo Graphics, Riva128, i740 cards are tested in the 16bit color, and the rest in the 32bit one. 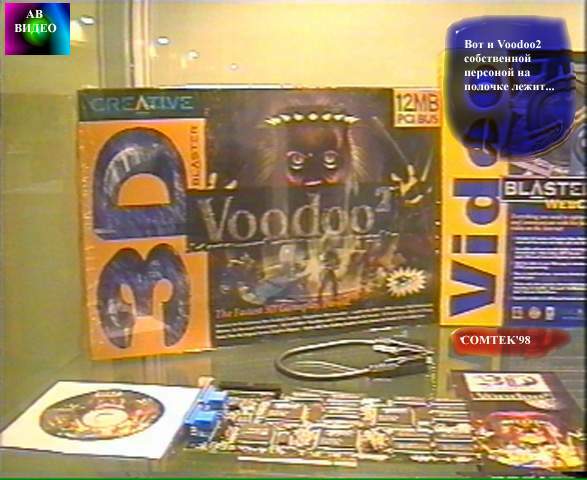 The Voodoo Graphics was tested in 640x480. Modern games bring to nothing performance of the former 3D leaders up to 2000 especially in the highest-quality mode. The FPS of such accelerators is very low, and the CPU's clock speed is not determining. 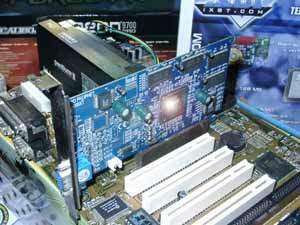 The modern accelerators on the weak platforms have a very low speed. 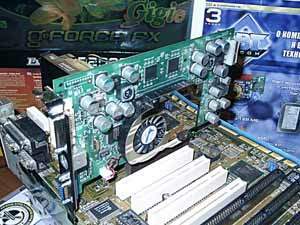 It was to be expected but some users do not understand that and install expensive graphics cards onto weak platforms. 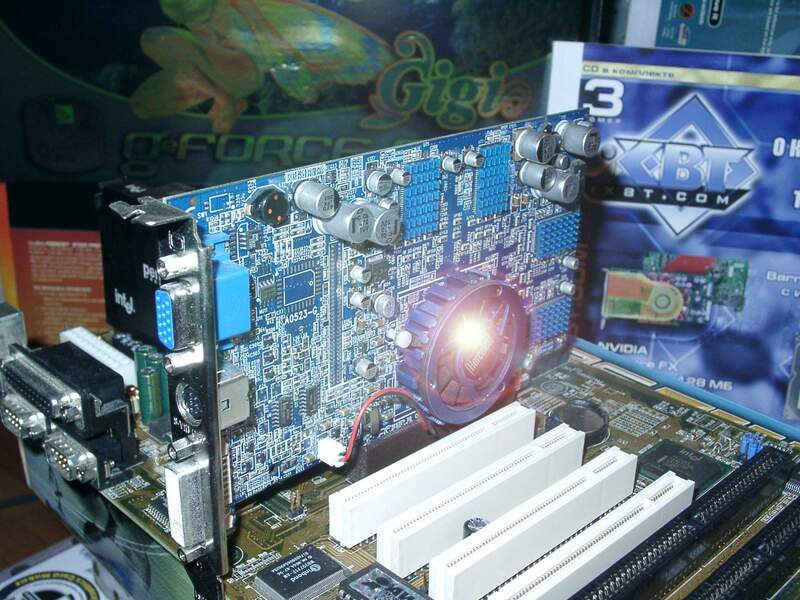 Note that such reviews are not going to be regular, i.e. 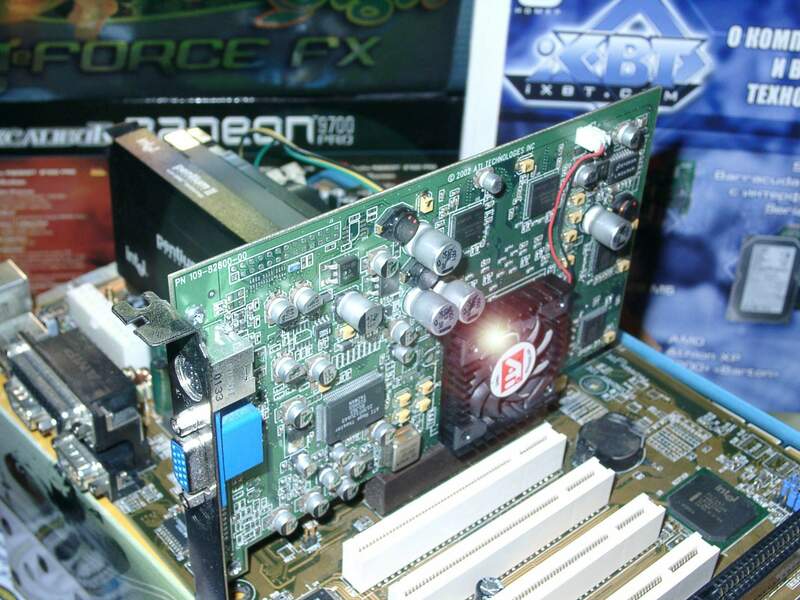 you shouldn't expect more test sessions like this one.